Enjoy a 2 night midweek stay for 2 at the lakeside 4* Tulfarris Hotel & Golf Resort in Wicklow incl. dinner. 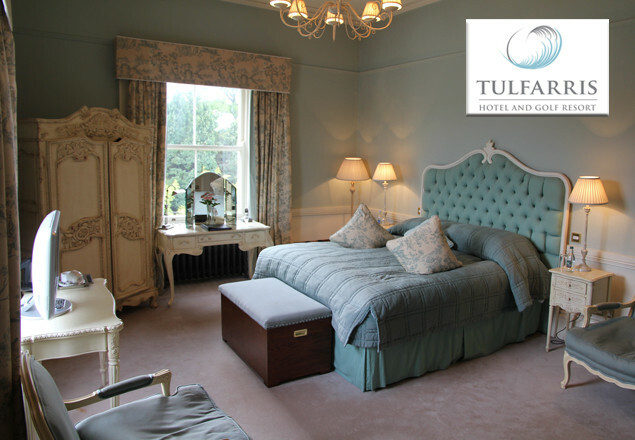 With this exclusive offer from Rewarding Times escape to the spectacular Tulfarris Hotel and Golf Resort just an hour from Dublin nestled between the Blessington Lakes and Wicklow Mountains. While staying at this lakeside haven you will be treated to a sparkling prosecco afternoon tea for 2 or a round of golf on one of Ireland’s premier championship courses followed by a sumptuous 3 course dinner on one of the evenings in the gastronomically renowned Lime Tree restaurant and then spend your evening luxuriating in a Deluxe Suite. This two night stay for 2 includes full Irish breakfast each morning and a late checkout until 1pm. Set amid 200 acres of mature parkland the estate seamlessly fuses the elegance and opulence of the original 18th century manor house with the stylish contemporary design of our 4-star hotel to welcome you to a whole new world of leisure and pleasure. Situated on the shores of the Blessington Lakes and bordered by the impressive rolling hills of County Wicklow, the stunning Tulfarris Hotel & Golf Resort is waiting to give you the ultimate retreat from city-life. Set on 3 peninsulas overlooking the Blessington Lakes the 18 hole championship golf course designed by Patrick J Merrigan delivers a feast for the senses, while providing one of the finest golfing challenges in the country. The imaginative use of the natural landscape is evident throughout the course and the integrity of the environs has been preserved with the ponding and the wild grasses as an extension of the lakeshore itself. While you blissfully escape city-stresses here at Tulfarris, get back to nature with rambling walks along the lake shore and adventurous cycling trails, regular boat tours, a cultural visit to the neighbouring Russborough House, or relax in our chill-out areas and indulge with a pampering treatment or two at our onsite Spa. And for those in need of the ultimate dose of retail therapy Kildare Village and Newbridge Silver are within easy reach of the resort. Tulfarris is an inviting culinary destination, the centre-piece of which is the exceptional Lime Tree Restaurant. Its breath-taking views of the 18th green, the lakes and impressive mountain terrain through their floor-to-ceiling windows perfectly compliment the mouth-watering fare on offer. Our delicious menus incorporate a blend of tastes and flavours combining international cuisine with the best of Irish, with ingredients and produce sourced from Irish farmers and suppliers where possible. Vouchers valid from April 7th until July 3rd inclusive, subject to availability.